The Indians who live on the farthest point of the northwest corner of Washington State used to tell stories, not about one Changer, but about the Two-Men-Who-Changed-Things. So did their close relatives, who lived on Vancouver Island, across the Strait of Juan de Fuca. When the world was very young, there were no people on the earth. There were no birds or animals, either. There was nothing but grass and sand and creatures that were neither animals nor people but had some of the traits of people and some of the traits of animals. Then the two brothers of the Sun and the Moon came to the earth. Their names were Ho-ho-e-ap-bess, which means "The Two-Men-Who- Changed-Things." 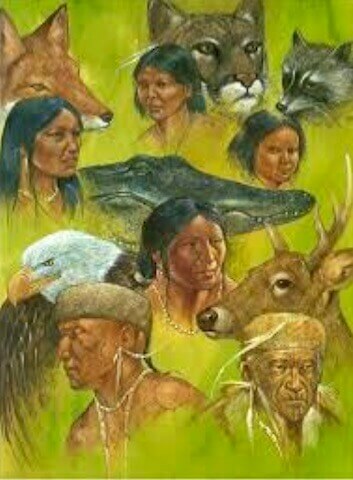 They came to make the earth ready for a new race of people, the Indians. The Two-Men-Who-Changed-Things called all the creatures to them. Some they changed to animals and birds. Some they changed to trees and smaller plants. Among them was a bad thief. He was always stealing food from creatures who were fishermen and hunters. The Two-Men-Who- Changed-Things transformed him into Seal. They shortened his arms and tied his legs so that only his feet could move. Then they threw Seal into the Ocean and said to him, "Now you will have to catch your own fish if you are to have anything to eat." One of the creatures was a great fisherman. He was always on the rocks or was wading with his long fishing spear. He kept it ready to thrust into some fish. He always wore a little cape, round and white over his shoulders. The Two-Men-Who-Changed-Things transformed him into Great Blue Heron. The cape became the white feathers around the neck of Great Blue Heron. The long fishing spear became his sharp pointed bill. Another creature was both a fisherman and a thief. He had stolen a necklace of shells. The Two-Men-Who-Changed-Things transformed him into Kingfisher. The necklace of shells was turned into a ring of feathers around Kingfisher's neck. He is still a fisherman. He watches the water, and when he sees a fish, he dives headfirst with a splash into the water. Two creatures had huge appetites. They devoured everything they could find. The Two-Men-Who-Changed-Things transformed one of them into Raven. They transformed his wife into Crow. Both Raven and Crow were given strong beaks so that they could tear their food. Raven croaks "Cr-r-ruck!" and Crow answers with a loud "Cah! Cah!" The Two-Men-Who-Changed-Things called Bluejay's son to them and asked, "Which do you wish to be--a bird or a fish?" "I don't want to be either," he answered. "Then we will transform you into Mink. You will live on land. You will eat the fish you can catch from the water or can pick up on the shore. " Then the Two-Men-Who-Changed-Things remembered that the new people would need wood for many things. They called one of the creatures to them and said "The Indians will want tough wood to make bows with. They will want tough wood to make wedges with, so that they can split logs. You are tough and strong. We will change you into the yew tree." They called some little creatures to them. "The new people will need many slender, straight shoots for arrows. You will be the arrowwood. You will be white with many blossoms in early summer." They called a big, fat creature to them. "The Indians will need big trunks with soft wood so that they can make canoes. You will be the cedar trees. The Indians will make many things from your bark and from your roots." The Two-Men-Who-Changed-Things knew that the Indians would need wood for fuel. So they called an old creature to them. "You are old, and your heart is dry. You will make good kindling, for your grease has turned hard and will make pitch. You will be the spruce tree. When you grow old, you will always make dry wood that will be good for fires." To another creature they said, "You shall be the hemlock. Your bark will be good for tanning hides. Your branches will be used in the sweat lodges." A creature with a cross temper they changed into a crab apple tree, saying, "You shall always bear sour fruit." Another creature they changed into the wild cherry tree, so that the new people would have fruit and could use the cherry bark for medicine. A thin, tough creature they changed into the alder tree, so that the new people would have hard wood for their canoe paddles. Thus the Two-Men-Who-Changed-Things got the world ready for the new people who were to come. They made the world as it was when the Indians lived in it.